Evil Acid is a lithograph and digital print on Gampi. Like much of Krueger’s work, the digital image is a direct reference to collected ephemera from Krueger’s high school days. Evil Acid refers to Krueger’s experiments with mind-altering drugs and the daredevil attitude of Evel Knievel, who passed away shortly before the print was made. Drown Giant is a lithograph and digital print on Gampi. Like much of Krueger’s work, the digital images are direct references to, if not actual scans of, collected ephemera from Krueger’s high school days. Drown Giant is an enlarged, torn out page from the artist’s high school notebook, which was mostly filled with drawings of his favorite metal bands. Detention is a lithograph and digital print on Gampi. Like much of Krueger’s work, Detention utilizes actual scans of collected ephemera from Krueger’s high school youth; in this print, he uses an old, crumpled detention slip. Crumpled again years later, the words “So What” emphasize an act of defiance and indifference. Michael Krueger often draws inspiration from recycled personal notes and scrapbook pages. Krueger has been printing on several varieties of gampi and other Asian papers that mimic the weight and feel of the original papers. 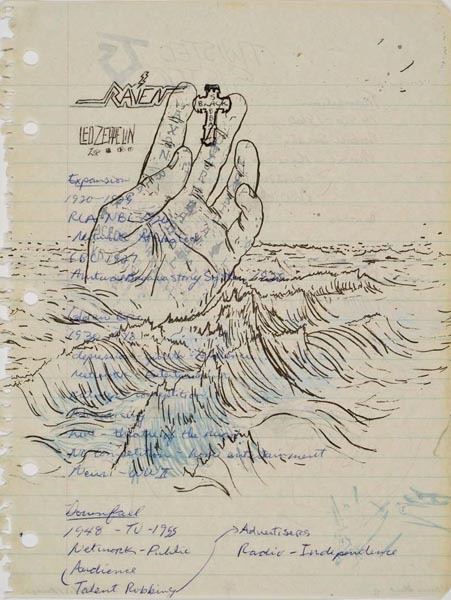 The recreated notebook pages are updated with images that evoke a sense of history and perspective from the artist’s past, as well as references to contemporary pop culture. Krueger’s creative research has taken him all over the globe and he has given lectures and workshops across the country. Krueger’s work is included in over 50 public collections including the New York Public Library, the Museo Del Barro, Asunción, Paraguay, Boston Museum of Fine Arts. He is currently a professor at the University of Kansas. You can find more of Krueger’s work at www.michaelkrueger.us.